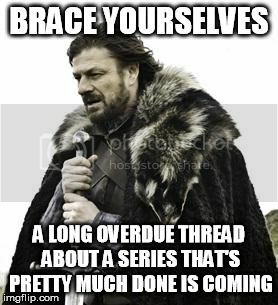 What's everyone's thought about no GoT this year? Anyone planning on going into a rewatch spree? That's what I'm planning to do. Did it never occur to that stupid Stark kid to weave left or right? Intelligence is not the male Starks' strong suit. I know right? And no one thought to give Wun Wun a tree branch or something? Da fuq? I think those guys who killed Al Swearengen and his peacenik cult weren't with the Brotherhood Without Banners. Mark me! The Brotherhood formed from soldiers from all sides of the Five Kings War who became disillusioned with the war. I believe they were last seen in season 4. How did the Brotherhood without Banners originate and even was the last time they were featured in this show. Also what are the Freys up to? They seem clueless.